Beautifully and delicately express your love for your beautiful little girl with this amazing wall decal! 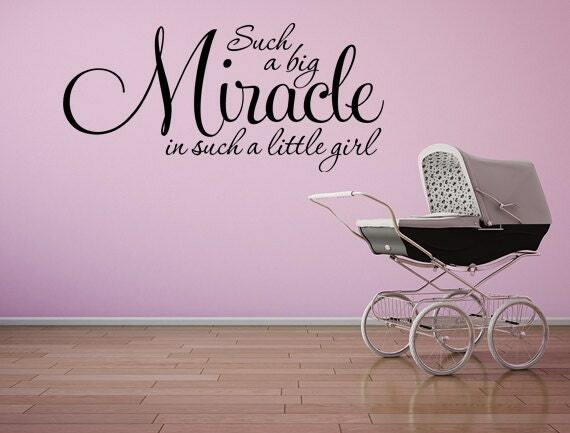 Our eye catching "Such A Big Miracle In Such A Little Girl" vinyl wall decal is easy to apply and looks hand painted. Removable but not reusable. Please note the size of this listing as the picture may not show the size to scale. This decal measures approximately 36 inches wide by 16.75 inches in height. This decal is available in additional colors and size but not in fonts. Please contact us regarding any customization questions. You can choose a color from our available selection when you check out. ♥ Our decals can be applied to most clean, smooth, hard and flat surfaces.